Curious George Plays Baseball is a worthy addition to any child's library. Watching everyone's favorite monkey help out the local baseball team is sure to bring a smile to a young reader's face. Curious George is one of the most beloved characters in children's literature. This adorable little monkey was created by Hans Augusto Rey and Margret Rey. H.A. Rey is generally listed as the illustrator and Margret Rey is credited as the writer of the Curious George stories, although the husband and wife team frequently stated that the books were truly a collaborative effort. George lives in the city with a man who is simply referred to as "The Man with the Yellow Hat." Each book in the series follows the same basic format. George goes to visit some place that young children would find appealing, such as a dinosaur exhibit at the museum, a pizza place, a fire station, or a parade. He is very excited and accidentally manages to cause trouble. However, he later redeems himself by saving the day. Everyone is always very quick to forgive George for his mistakes, which is an appealing concept for young readers who frequently find themselves in trouble for their own accidental mishaps. You can learn more about the various books in the Curious George series by reviewing the LoveToKnow Children's Books article Curious George Book List. Curious George Plays Baseball is part of a collection of Curious George books that fans sometimes refer to as the "new adventures." These books were written well after the death of both H.A. and Margret Rey, but remain true to the style and intention of the original Curious George books. 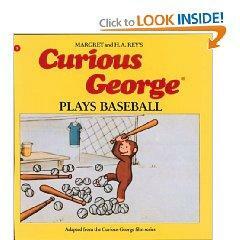 Curious George Plays Baseball is recommended for children ages 4-8. The text is simple enough for beginning readers to follow and the illustrations do a good job of reinforcing what's on each page. Younger children may still enjoy having the story read to them, however, especially if they have seen the Curious George movie or the PBS television show. First published in 1986, this 32-page book describes how George attempts to play baseball like his friend Jimmy. Everyone's favorite mischievous monkey tries to bat a few balls with the team, but he is chased away by angry players who think he is just causing trouble. However, George later makes a catch that none of the other players could manage. He helps the team win the game and becomes a hero in the process! Fans who love baseball will enjoy this book because the simple text does a great job of describing the excitement of the game. Young readers can call "foul ball" with the umpire and try to guess what team is going to win the game. But, even kids who don't like baseball can still appreciate George's enthusiasm for learning more about the sport. Children who enjoy reading the Curious George Plays Baseball book may also be interested in Curious George at the Baseball Game. Published in 2006, this story describes George's first trip to the baseball stadium. The Man with the Yellow Hat is friends with the head coach of the Mudville Miners. The coach decides to arrange for George to watch the game from the dugout. George is very excited to be in the big stadium. He sees the coach making hand signals and thinks this is how you are supposed to cheer for the players. Unfortunately, George's wild gestures confuse the baseball team and get him banished back to the stands. He encounters a camerawoman filming the game and makes her angry by getting in front of her shot. However, his antics help to direct a lost boy back home to his father. Once again, George manages to save the day!